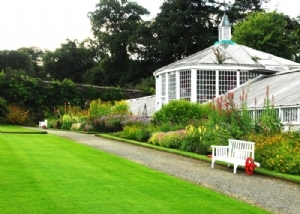 At one point last month Ireland’s horticultural bush telegraph cranked up and spread the good and rather unexpected news that one of the country’s great gardens would be open again but just for one day. On Twitter and Facebook, in text message and phone call, a whole community heard that Mount Congreve could be visited; and they came in their thousands on an overcast Thursday afternoon to a corner of Co Waterford where the plantings made by one inspired man have become part of European garden legend. 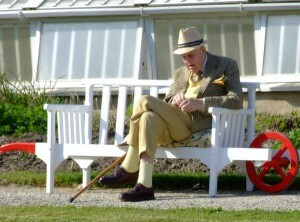 The man was Ambrose Congreve, the last of the Waterford Congreves, who died in 2011 at the age of 104. It was his intention to bequeath the house and gardens – which cover some 70 acres – to the nation and he had made arrangements to do so. However, after his death, just as the Office of Public Works were preparing to take over the property, a legal glitch was spotted and both the OPW and the Mount Congreve Trust are reported to be seeking a solution. The problem is said to revolve around the technicalities and timing of transfer of ownership. However. there is much local fear that the OPW, under pressure as all public bodies are, has no great desire to add Mount Congreve to the gardens in their care. The OPW press office has not responded to my inquiries at the time of going to press. (They did eventually, saying that it would not be appropriate to comment as negotiations are in progress). In the meantime, one of Europe’s great gardens remains closed, the cost of maintenance met by another body, the Congreve Foundation, which manages the late Mr Congreve’s very substantial assets. The sale of contents of the house, last October, according to a local source, was necessitated by the huge cost of wages. 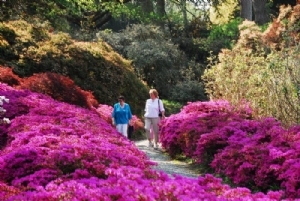 Mount Congreve was one of – surprisingly – four great Irish gardens which were created in the second half of the last century, not an era when you would expect such undertakings in a poor country with a dwindling aristocracy. Henry McIlhenny, of the Tabasco Sauce family, took advantage of the gulf stream at Glenveagh Castle in Co Donegal; Lord Talbot de Malahide coaxed an amazing collection of Australian and Tasmanian plants to thrive in the alkaline soil of the north Dublin suburbs; Lord and Lady Rosse of Birr Castle started a little earlier and were already helping to fund plant-hunting expeditions to China before World War II but their 150 acre garden, in the coldest part of Ireland, was essentially put together in the 1950s and 1960s. Mount Congreve’s golden age, in terms of planting, extended for longer. 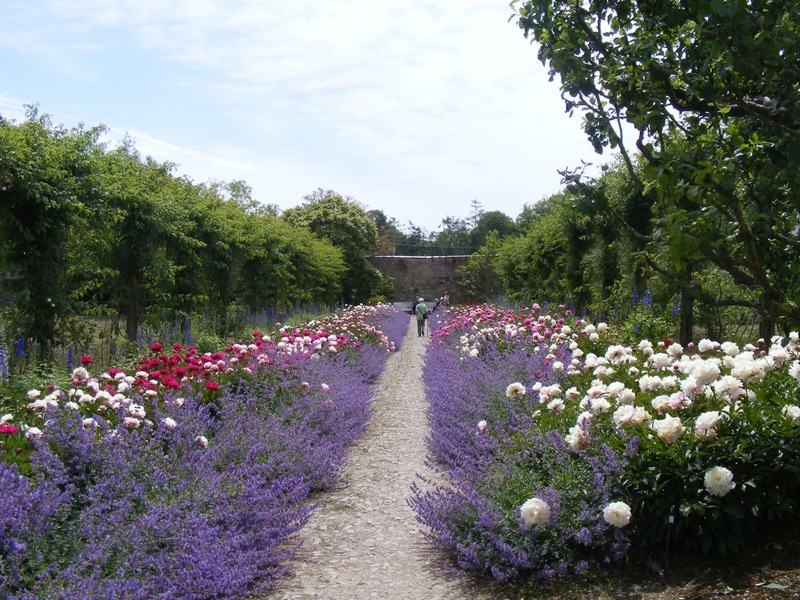 Ambrose Congreve made his mind up to be a gardener at the age of eleven and he always claimed that his eureka moment had come when visiting the de Rothschild garden at Exbury in England. Both Exbury and Mount Congreve are conceived on a grand scale, but not a grand manner. In both places it was never enough to plant one example of a shrub or tree; lots of them were put in. Ambrose Congreve started gardening on the family estate in 1918 and his enthusiasm never waned; if anything, it grew. After being sent to school at Eton and to university at Cambridge, he joined Unilever and started to display his exceptional ability in business. But he continued planting at Mount Congreve where his parents continued to live until their deaths in the 1950s. The Congreves were not poor but they were not in the same financial league as the Beresfords of nearby Curraghmore or the Rosses of Birr Castle. Ambrose Congreve married Margaret Glasgow in 1935. Her father, Arthur, owned half of Glasgow and Humphreys, an Anglo-American engineering company which made a fortune supplying the hardware that went into gas plants throughout the world. Soon, Ambrose Congreve was working for his father-in-law’s company, where he eventually became chief executive and chairman. Even though he spent many years at the helm of a major company, and the war years with Air Intelligence, his horticultural heart remained in Waterford and he continued planting – always on a grand scale. If you want to see a plant, he would advise gardeners who had sufficient space to do so, put in five of them, not one. Or fifty of them. Even in the flower garden the same philosophy is evident. Two huge, long borders packed with pink and white paeonies and lined with purple spikes of nepeta face each other across a gravel path. The scent, as you walk down that path, is almost overwhelming. Ambrose Congreve almost certainly held the world record for the number of magnolias planted by one man. In the early 1960s he planted sixty Magnolia campbellii along one of the walks by the River Suir. Indeed, there is a mile and a half of magnolias, unequalled anywhere. Although he was a great exponent of mass planting, he was not just a gardener but also a plantsman, someone whose fascination with the diversity of the botanical world was channeled through collecting. The evidence is there to see. Estimates of how many individual rhododendrons grow at Mount Congreve range from 3,000 to 4,500 but whatever is the true figure this is almost certainly the largest collection of rhododendrons in the world. There are 300 varieties of magnolia, 600 varieties of camellia (who thought that so many existed?) and over 250 Japanese flowering cherry and acer cultivars. All of these are framed, in a sense, by ancient woodland, the oaks planted when the Congreves first came here over 300 years ago and the other broadleaves put in by succeeding generations. 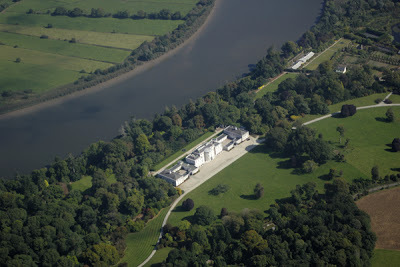 Thanks to the substantial wealth of Ambrose Congreve and his wife, the house and estate were unique in twentieth century Ireland, so well appointed and lavishly run were they. After his father’s death in 1957, Ambrose Congreve gutted the house and created the kind of comfort within it of which most other owners of Irish stately homes could only dream. He also set about restoring the greenhouses in the four-acre wallled garden and soon grapes, peaches, nectarines were being grown again for the table and huge vegetable beds were interpersed with flowers for cutting for the house. Guests were ferried to and from Cork airport in a Rolls-Royce Phantom II limousine, with hand-built coachwork, one of only two in the country. Mount Congreve had, between house, gardens and nursery some seventy staff – a state which no other grand Irish estate had seen in over fifty years. The staff presented Ambrose Congreve on his hundredth birthday with a Wollemi pine, a recently discovered plant survival from the age of the dinosaurs. At lunch on the same day he remarked that while there are many routes to temporary happiness, the way to be happy forever is to plant a garden. Although there was no benefit for him in doing so, Congreve opened his private domain to visitors on Thursdays between April and October. At other times, visits were by appointment and he liked to test the knowledge of visitors by asking them to identify three unusual plants which he kept in pots by the garden gate. If you got all three right, you got the full tour; less than that, and the visit was short. The wholesale nursery which he established in the 1960s (and which continues as a separate business) won many medals for its displays at the “plant Olympics”, the Chelsea Flower Show. It was fitting, therefore, that when Ambrose Congreve’s long life, so much of it devoted to planting, came to an end, he was in London for that very event. He and his wife are buried in the grounds of Mount Congreve, beneath a little temple overlooking the River Suir. Let’s just hope that his generous gift to the people of Ireland is treated with the respect that it deserves. Mount Congreve’s significance as a garden means that it belongs not just to Waterford and to Ireland but to the whole world. The OPW and the Government must act. Very well said. We have to save Mount Congreve. Your description has made me want to visit so much!! I sincerely hope you have got in touch with the Irish Georgian Society if they aren't already campaiging on the matter. We need to cherish places like Mount Congreve. 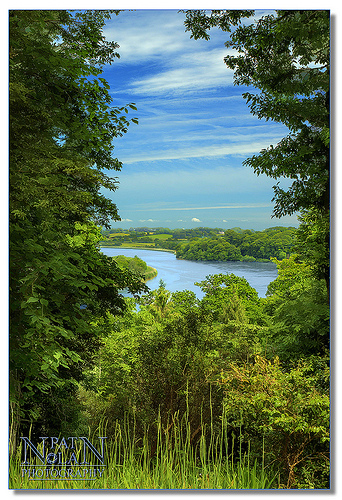 I live in Portlaw and we have access to Curraghmore Estate its such a treasure and a beautiful serene place to walk etc. Fantastic article. Very well written, Mount Congreve is a special place and needs to be kept so.